Concerns exist about the use of radioactivity in food irradiation, the presence of possible subsequent toxicity, and the development of more virulent bacteria . These concerns, however, are unfounded and the benefits outweigh the risks. Evidence from over four decades of research in the United States shows the benefits to include a decrease in food-borne pathogens , an increase in the shelf life of some fruits and vegetables, and less fumigant use for controlling insect pests. The Food and Drug Administration (FDA) ensures that injury, such as disease or illness, will not result from substances in food by closely monitoring the food supply. This differs from monitoring for food hazards (the responsibility of the food handler), where harm is possible under normal conditions. Potential food hazards could include improper storage conditions and serving food at unsafe temperatures. The food handler is directly involved in controlling these potential hazards during receiving, storage, preparation, cooking, and service. The primary agencies that monitor the safety of the U.S. food supply are the FDA, the U.S. Department of Agriculture (USDA), the Environmental Protection Agency, and the U.S. Fish and Wildlife Service. When monitoring the food supply, the FDA focuses first on microbial food-borne illness, followed by natural toxins in food, and residues in food, including environmental contaminants, pesticides, and animal drugs. Nutritional composition and intentional food additives are monitored more closely as artificial food products enter the market. The FDA Food Code, which is published every two years, provides guidance for restaurants, grocery stores, and institutions such as nursing homes on how to prevent food-borne illness. Managers and supervisors of these institutions are now required to be certified in food safety and sanitation. Local, state, and federal regulators use the Food Code as a model to develop their own food safety rules. Each year, millions of people become ill from food-borne illness, the most common food safety-issue, although many cases are not reported. Food-borne illness is caused when toxic levels of pathogens or bacteria are present in food. Microbial food-borne illness, commonly called food poisoning , is monitored closely because the cases of food poisoning far outweigh any other type of food contamination. In the case of an infection from a pathogen such as Salmonella, contamination and food-borne illness results when a pathogen in a food product multiplies and infects the human body after ingestion. These microorganisms can multiply in food during agricultural production, transportation, preparation, and storage, or within the digestive tract after a person eats the contaminated food. Factors that contribute to food toxicity include the amount of the initial contamination, the time held in unsafe conditions, and the use of processes to inactivate or remove toxins and pathogens. The Centers for Disease Control and Prevention (CDC) reports that most food-borne illness outbreaks occur from improper handling of food in the retail area of the food industry (e.g., schools, restaurants). Equally important is safe food-handling by consumers who purchase food and consume it at home, since most cases of food poisoning are a result of improper handling or cooking after purchase. For many victims, food-borne illness results only in discomfort or lost time from the job. Those at higher risk—pre-school-age children, older adults in health care facilities, and those with impaired immune systems—food-borne illness is more serious and may be life threatening. Symptoms of food-borne illness vary, but can include nausea , vomiting, abdominal cramps, headache, and in some cases difficulty speaking and swallowing. Some instances could result in paralysis or death. Fever fatigue and jaundice occur after several days in hepatitis cases. To protect consumers from food-borne disease, efforts must focus on each point in the farm-to-table chain to better predict and prevent food-borne hazards, and to monitor and rapidly react to outbreaks of food-borne diseases. A food-service establishment should have an effective food-safety program to prevent hazards before they occur. For example, the Hazard Analysis Critical Control Point (HACCP) program is a proactive program initiated by the FDA to ensure food safety for the astronauts in the space program. The process starts by reviewing a food service's standard operating procedures to be sure that food hazards are controlled during receiving, storage, preparation, service, and cooling of foods for later use. An examination of sanitation, as well as food handlers' personal hygiene and work practices are important as well. 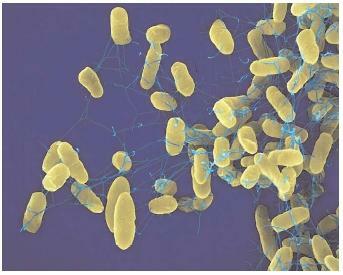 Salmonella enteritidis bacteria annually infect between two and four million people in the United States. Most outbreaks of food-borne illness are due to improper food handling or storage. damage, and central nervous system impairment. As with antibiotics , the targeted insects become resistant and can survive exposure, emerging with increased vigor to again attack the crop. The same effects arise from herbicides and fungicides used on crops. New labeling laws introduced by the FDA in October 2002 have caused some organic producers to drop the term organic from their label, finding the requirements too restrictive. Genetically modified foods have been a cause of concern in many parts of the world since their introduction, particularly in Europe. Campaigns have been launched by many groups opposing the practice of genetically altering enzymes , amino acids , and genes in foods for the purposes of increasing crop yields, nutritional quality, and profits while decreasing food waste. Whether it is about changing the degree of saturation in oils or adding amino acids to corn to make it a more complete protein source, food technologists are working hard to change the chemical make-up of food. Organic farming groups and others will likely continue to fight against the use of pesticides and genetic modification in food production for years. When trying to feed the world, one must weigh the risks and benefits of both when establishing food-safety regulations. tuberculosis and some food-borne infections) constitute growing threats to health and life around the globe. An attack through plant or animal disease would have significant economic impact. Current systems that detect food-borne illness outbreaks and link them to their source need to be enhanced for defense against food bioterrorism. However, the potential for an undetected contamination in industrialized countries is relatively low. Once food has been processed and readied for distribution, quick identification of any contamination and isolation from distribution is required. Imported food products may be more likely to be contaminated with a pathogen by terrorist groups. Another concern is deliberate infection of crops and herds. Citizens must rely on government security and public health measures such as emergency preparedness, secure food and disinfected water supplies, and good medical care to reduce the likelihood of contamination. In response to an increased risk of terrorism, the Alliance for Food Security has partnered with the FDA and the National Food Processors Association to provide domestic food and water security. In addition, the FDA has published a guide that outlines strategies to minimize contamination, providing guidance in seven areas of food service, from management to operations. The U.S. Public Health Service Commissioned Corp (PHS) is a uniformed service of the United States comprised of health professionals and led by the Office of the Surgeon General. The origins of the agency can be traced to a 1798 act that was passed to provide care for sick and injured merchant seamen. Formalized in 1889, it oversaw quarantines and medical examinations of immigrants. The agency commissioned officers to control the spread of contagious diseases such as smallpox and yellow fever through the 1900s. It also conducted biomedical research, provided health care to deprived groups, and supplied medical assistance to victims of natural disasters. The PHS began its food-protection activities in the early 1900s with studies on the role of milk in the spread of disease. 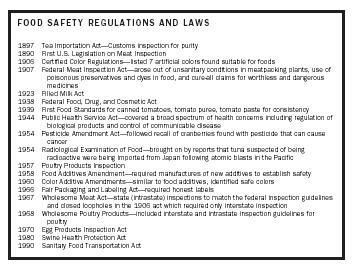 Model food codes and other regulations soon evolved to ensure food quality and safety. These include sanitary practices at processing plants, safety standards for ingredients, and labeling laws to assist state and local governments in initiating and maintaining effective programs for the prevention of food-borne illness. SEE ALSO Additives and Preservatives ; Biotechnology ; Genetically Modified Foods ; Irradiation ; Organisms, Food-Borne ; Pesticides ; Regulatory Agencies . Jackson, R. (1997). Nutrition and Food Services for Integrated Health Care. Gaithersburg, MD: Aspen. National Restaurant Association Foundation (2002). ServSafe Essentials, 2nd edition. Chicago: Author. Sizer, Francis, and Whitney, Eleanor (2003). Nutrition Concepts and Controversies, 9th edition. Belmont, CA: Wadsworth/Thomson.